* TIMING… SNOW BEGINNING THIS EARLY THIS EVENING AND LASTING THROUGH SATURDAY MORNING. * ACCUMULATION… TOTAL SNOW ACCUMULATION OF 3 TO 6 INCHES BY LATE SATURDAY MORNING. When there is a weather report like that, you need warm boots, you need Khombu. Launched in 1969 as a waterproof brand designed for outdoor enthusiasts, the name Khombu originated from the Khombu Valley near the base of Mount Everest. Mount Everest is in the Himalayas, the world’s largest mountain range located in Nepal. There are days when Chicago feels like Mt. Everest… or worse. But with waterproof protection, exceptional performance, and comfort I can stand anything Chicago weather throws at me. With a rich heritage in the rugged boot market, Khombu delivers the ultimate in functionally engineered footwear complimented by contemporary styling to meet today’s outdoor lifestyle needs. Khombu Boots are waterproof, exceptionally comfortable, with many performance features. They use leading edge materials and, depending on the intended use of the specific model, contain materials such as Thermolite® for insulation which will protect you from the cold to -20 degrees Fahrenheit, soft plush fleece, and/or fur linings to keep your feet warm. All of their footwear has memory technology components for all day comfort and breath ability. I love my Khombu boots! I’ve had one pair for years and was just sent a new pair from Khombu for review and they are sooooo warm and cozy. My feet are happy and dry in Khombu boots. My daughter is happy with my Khombu’s too – she says mom looks “cool”. Which when your 8 is more important than warm and dry… Yay, mom! (and by “mom”, I mean “Khombu”). 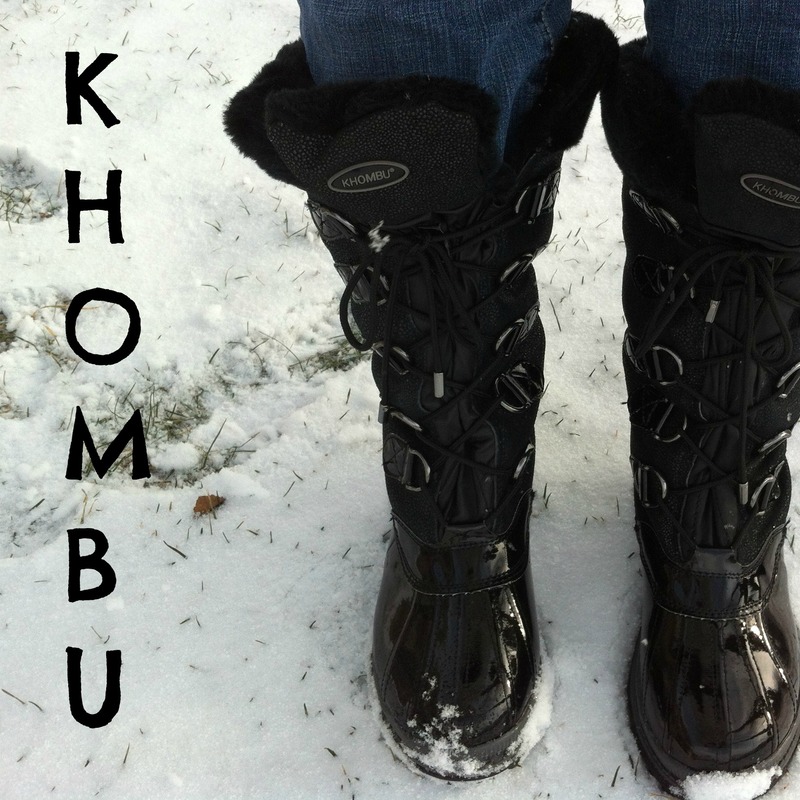 One lucky KLY reader is going to win a pair of Khombu boots! Enter in the Rafflecopter form below and good luck! Disclosure of Material Connection: I was sent a new pair of Khombu boots for review. I like the memory technology components for all day comfort and breath ability. I like that they have been in business since 1968 and specifically specialize in waterproof boots. So they must know what they are doing. I also like that the fit is so very comfortable. I love how the boots can protect your feet up to -20 degrees! I like that they are waterproof. I looked at their site and fell for the Aero & Igloo… so cute & the waterproof/ anti microbial is awesome! I live in the COLD Northeast, so I like that they can protect you in -20 degree weather! I like that they are comfortable and will keep your feet warm up to -20 degrees. I like that they have fleece inside and are waterproof. Waterproof,rugged,warm and pretty! What more could you ask for in a boot! I like that they are comfortable. Most snow boots are not. I like the Thermolite® insulation which will protect you from the cold to -20 degrees Fahrenheit. I think the memory technology probably makes them super comfortable. I love that they are waterproof!! I like that they’re so warm (insulated). That they are waterproof! Cold, wet feet are the worst! The fact that they are waterproof – our Winters here have less snow & more sleet, ice & rain – so that & the fact that they have been in business since 1969 – great track record!!! Thanks for the chance…. I sure could use these! I left a comment on this post: http://kellysluckyyou.com/holiday-tree-decorating-party-appetizers-seapak/ Thanks! I love that they are waterproof. That is huge when you have to trudge through lots of snow and ice. Living in New England, the most important features are warmth and waterproofing. These boots fit the bill! I like that it’s waterproof, which would be great for walking through snow! i love the thermolite insulation rating on them!! thats great for working outside! I love that they are waterproof! I love that they are cute and practical! I love that they are insulated with Thermolite so they can go to -20. Up here,. we see some frigid temperatures and these would be perfect. Thank you for the wonderful giveaway! Thermolite® for insulation is my favorite feature. i live in portland oregon, so waterproof is a must. waterproof AND cute?!?!? that’s just fabulous! My favorite feature is Thermolite® for insulation. My favorite feature is the Thermolite® for insulation.